Reviews from R'lyeh: What Price Dice? It seems that all of the classics are getting dice games. First it was Mayfair Games’ Catan Dice Game and then it was Days of Wonder’s Ticket to Ride: The Dice Expansion, and now as part of the game’s tenth anniversary, Rio Grande Games has released Carcassonne the Dice Game. I have been a fan of Carcassonne for several years now, it not only being my introduction to Euro games, but also my means to introduce several other players as well as my daughter to the hobby. Carcassonne the Dice Game is a filler of a dice game for between two and five players designed to be played in ten minutes, the winner being the first person to gain forty-two points by rolling and building complete cities. 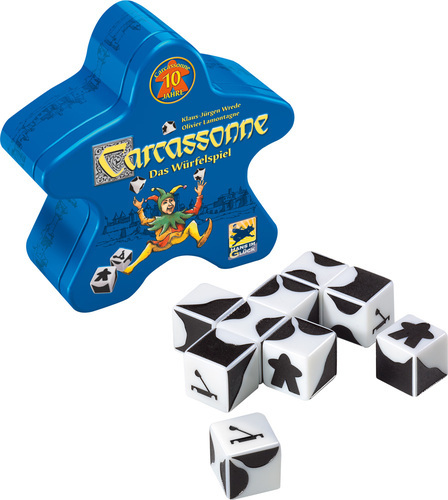 The game comes in a Carcassonne blue meeple-shaped tin that contains nine Carcassonne Dice, a small pad and pencil, and an eight-page meeple-shaped foldout rules sheet. Of these, the best description of both the dice and the pencil is that they are functional and nothing more. The nine dice though, are done in black and white plastic, each of them the same. On four of its faces, each die is marked by black city sections, whilst the other two are marked with a catapult and a meeple or knight. The players take it in turns to roll the dice, up to three times on a player’s turn. If he rolls city sections, he can use them to create a city, the aim being to build a complete, closed city by the end of his turn. If he rolls any catapult symbols on the dice, he must pass them to the next player to roll and so cannot roll them again this turn. If he rolls three meeples or knights over the course of the three rolls, a player gets to keep one of them and passes the remaining eight dice to the next player. The player holding the knight does not score anything this round, but gets to keep it for his next turn when he can score double points for completing a closed city. So in effect, keeping a knight back is a means of reducing the number of dice that the other players get to roll on their next, just as rolling catapults on a player’s denies him the opportunity to score points that having more dice available on re-rolls would allow. A game is won by the first player to score forty-two points. The other way is for a player to roll nine catapults over the course of the three rolls of his turn. This immediately wins him the game. Physically, Carcassonne the Dice Game is well presented, if you ignore the bland functionality of the pad and pencil. The rules are nicely done and they are easy to read. The dice themselves are solid and feel good in the hand. It is a pity that they have been done in black and white though as opposed to the brown of the cities and green of the farms in Carcassonne itself. Carcassonne the Dice Game is light and fast to play. As a quick filler it will probably keep everyone involved for its suggested playing time. If there is an issue with the game, it is the cost. Some of that cost is understandable. After all, it consists of three non-standard items – the dice, the rules leaflet, and the tin, and these are going to be costly. Yet the problem here is political. The retail price for this game in the USA is $17.50, which is roughly £11 here in the UK. Even when V.A.T. is added on to make it £13, the actual retail price is £14.99. This is certainly not the fault of Carcassonne the Dice Game itself, but ultimately it pushes what is a pocket friendly game too far away from having a pocket friendly price.